At first, from a distance, they appear to be maps. They come more into focus. Large patches of grass and weeds surround the grey concrete rectangles at the center of each image. There is exposed piping for plumbing or heat. 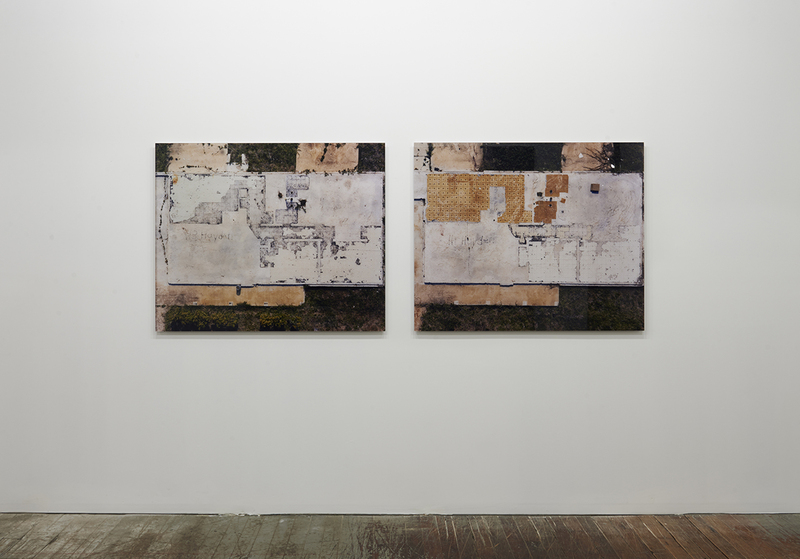 Two images that only a moment ago were observed in the way one glances at a cartographic rendering of a subway system or an atlas on a wall, reveal themselves to be aerial photographs of the foundations of two homes. In an instant these images are no longer approachable on a horizontal axis, instead we fall into them like stones from the sky. Clay Ketter, “Oden Junior & Oden Senior,” 2007. Diasec-mounted C print, 39 1/4 x 47 1/4″ each. Courtesy of the artist. Photo by Zack Garlitos. Large black scuff marks, cracks, and grooves in the foundations’ concrete flow seamlessly through the perimeters of grid-work that defines where rooms would otherwise be and where walls would have divided the space into three-dimensional sections. Whatever moved across these surfaces and removed the rooms of these homes was evidently greater than the sum of their parts. Oden Junior & Oden Senior look as if they depict the foundations of the same home. Judging from their appearance, it is possible that these images are of one location photographed six months apart—enough time for the linoleum to tear away and the debris to scatter. The photographs though, are of two different addresses: 111 and 113 Hayden Avenue. One home was owned by an older couple, and the other, by their son and his family. This means that the reality of the homes’ individual existence cannot be found in appearances alone. This is reminiscent of IKEA products, which Ketter has worked with in the past, whose lines of furniture all replicate themselves. The furniture’s existence—what makes it real—has no connection to an original or to the appearance thereof, but to the process of replication itself. As for Oden Junior & Oden Senior reality appears not only to imitate art, it appears to imitate itself and, when photographed, art appears to imitate reality. As for Oden Junior & Oden Senior reality appears not only to imitate art, it appears to imitate itself and, when photographed, art appears to imitate reality. Like a hummingbird spinner—those children’s toys made of paper, two drawings, and string—on which a bird takes flight when the paper is spun, these photographs move us because they exist in a permanent state of nostalgia. They move because they are never what they appear to be and have lost a connection to what they once were. The sensation of falling these photographs induce is brought on by this nostalgia. It is an infinite and unrequited desire to return these homes to an original state that remains undefined, or, at the very least, to return these photographs to how we first found them—their appearance as maps—in order to erase the reality of what occurred. In the image at right there is a beaded necklace left on the linoleum by someone passing through after the hurricane. It, like the linoleum itself, once touched human skin. Across the kitchen floor groggy barefooted children may have walked to the breakfast table, in the same kitchen that once was the makeshift bed for two newlyweds, in love on the floor.